Researchers from the Suffolk County Department of Health Services have confirmed the presence of cyanobacteria (also known as blue-green algae) at Lake Ronkonkoma* off Pond Road, in the Town of Brookhaven. Brookhaven, NY - August 25, 2015 - Researchers from the Suffolk County Department of Health Services have confirmed the presence of cyanobacteria (also known as blue-green algae) at Lake Ronkonkoma* off Pond Road, in the Town of Brookhaven. Health officials ask residents not to use, swim or wade in these waters and to keep pets and children away from the area. Cyanobacteria are naturally present in lakes and streams in low numbers; however, they can become abundant, forming blooms in shades of green, blue-green, yellow, brown or red. They may produce floating scums on the surface of the water, or may cause the water to take on paint-like appearance. Some species of cyanobacteria produce toxins that can cause health problems in humans and animals if exposed to large enough quantities. Contact with waters that appear scummy or discolored should be avoided. If contact does occur, rinse off with clean water immediately. Seek medical attention if any of the following symptoms occur after contact: nausea, vomiting or diarrhea; skin, eye or throat irritation; or allergic reactions or breathing difficulties. To report a suspected cyanobacteria bloom at a body of water that contains a Suffolk County-permitted bathing beach, contact Suffolk County Department of Health Services’ Office of Ecology at 852-5760. To report a suspected cyanobacteria bloom that is in a body of water that lies within Suffolk County but does not contain a permitted bathing beach, contact the Division of Water at New York State Department of Environmental Conservation: (518) 402-8179. *Lake Ronkonkoma Beach in the Town of Islip is open for bathing. Cyanobacteria have not been detected at levels warranting beach closure at Lake Ronkonkoma Beach this summer. 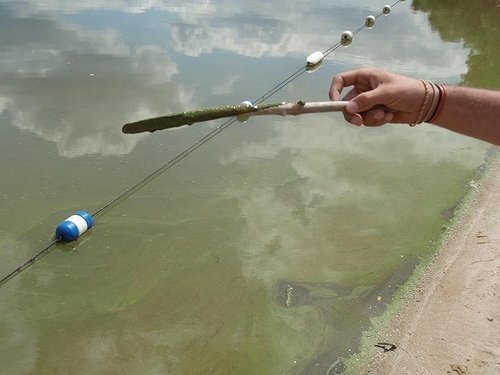 Suffolk Officials Encourage Residents to "Learn to Be Tobacco Free"
Subject: LongIsland.com - Your Name sent you Article details of "Health Officials Warn of Cyanobacteria Bloom on Lake Ronkonkoma (Brookhaven Side)"